Transformation phrase: Millennium Power, Make Up! Attack phrase: Millennium Order: Let Us Have War! 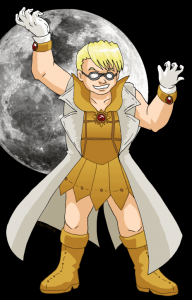 Sailor Millennia is the final villain of the series, and, as it turns out, the power behind all the others. He craves destruction for destruction’s sake, and to that end he commands a small army of Sailor Knights, who wear mind-controlling FREAK bracelets to place them under his control. With the masked vampire out of the country (supposedly on a cruise…but why hasn’t Integra heard from him? ), our heroines are on their own, and Sailor Millennia takes the opportunity to pick them off one by one.